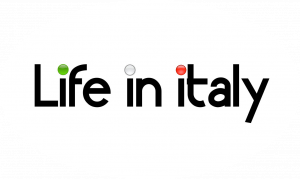 “This is a good example of food we do at home, not in the restaurant,” Francesco says. 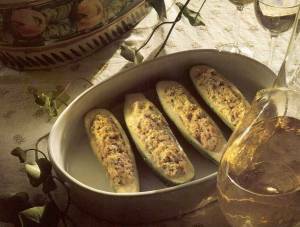 The zucchini stuffed with well-seasoned veal are excellent served hot or at room temperature. You might drizzle them with a little basil oil before serving. Slice the zucchini in half lengthwise. Scoop out the centers and discard them, leaving shells about 1/2 inch (1.3 cm) thick. Heat the oil in a heavy skillet. Add the onion, celery, carrot, garlic, and bay leaves and saute over low heat until the vegetables are soft but not brown. Remove from the heat, discard the bay leaves, and add the basil, rosemary, and wine. Stir in the veal and grind the mixture together in a meat grinder or food processor. Add the cheese and egg to the meat mixture and mix to combine. Season with salt and pepper. Pack the meat mixture into each zucchini shell and dot with butter. 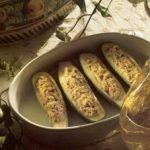 Place the stuffed zucchini in a baking dish and add water to a depth of 1/2 inch (1.3 cm). Cover the zucchini with a sheet of foil and bake for 25 to 30 minutes. Serve warm or at room temperature.